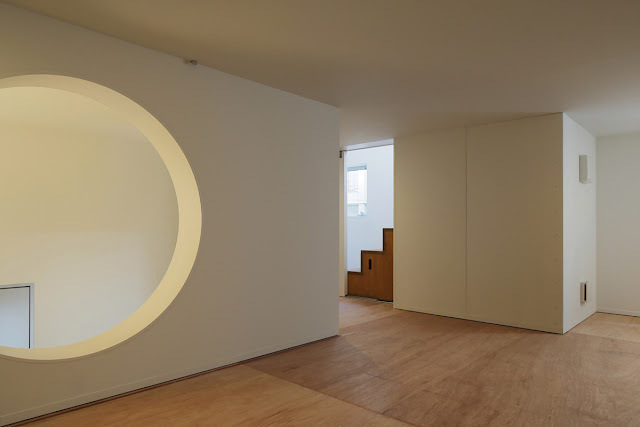 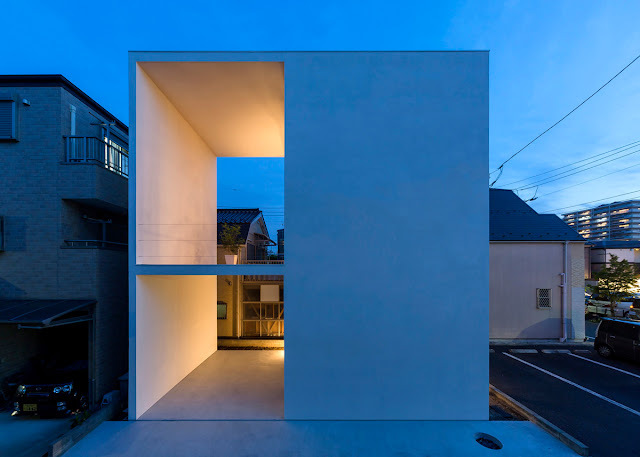 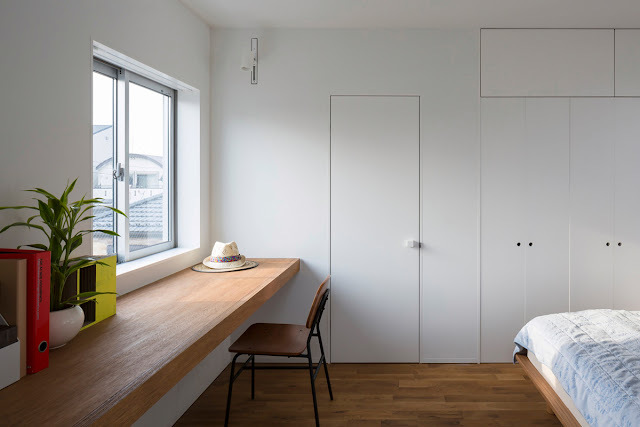 Japanese architect Takuro Yamamoto designed a minimalist house in Tokyo, Japan, featuring a rich external space in a significantly limited site area. 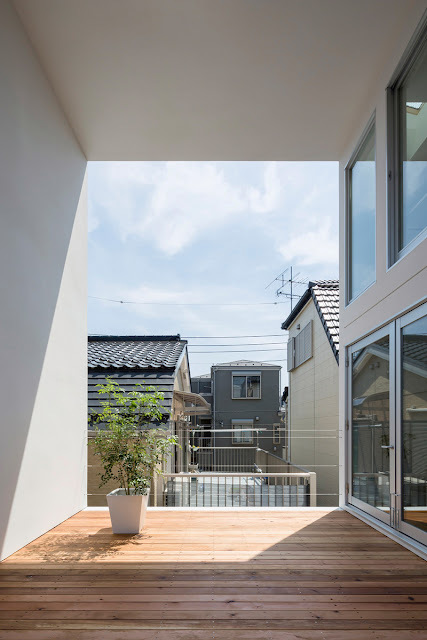 This big terrace area brings fresh air and daylight to the internal spaces, connecting with the main living spaces and the bedroom through large floor to ceiling windows. 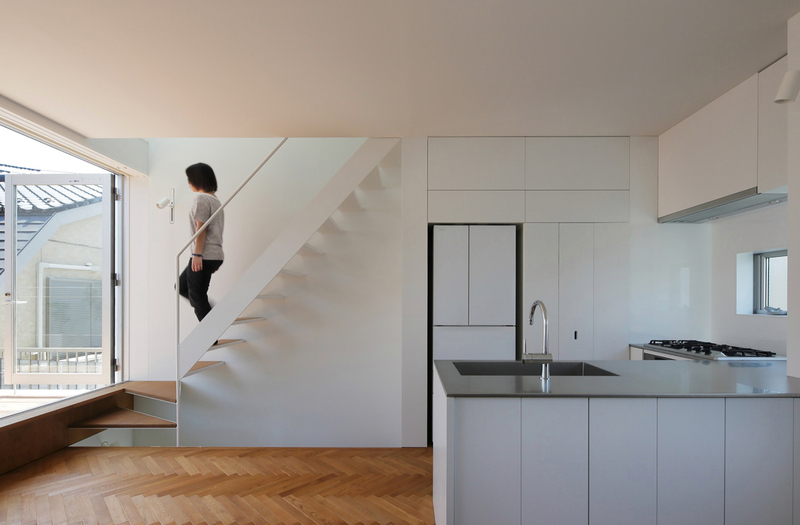 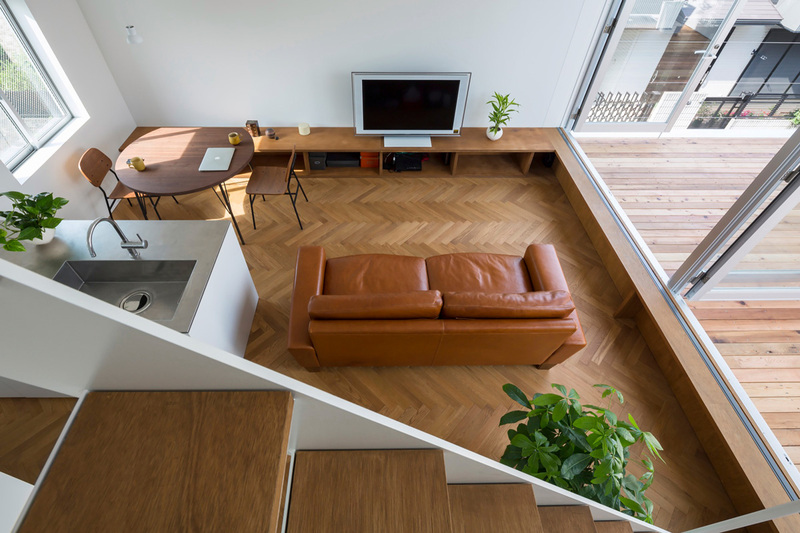 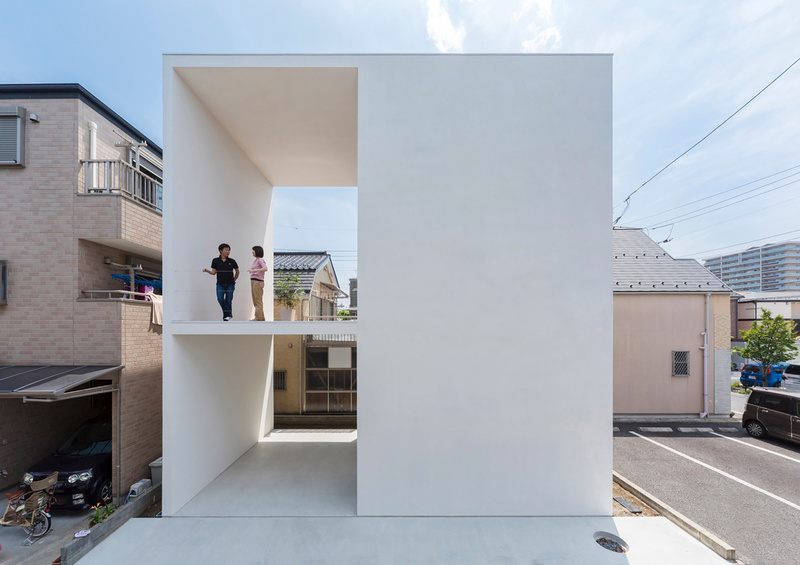 “Little House with a Big Terrace is a lucid example of having large external space in small urban residence with limited site area of Tokyo. 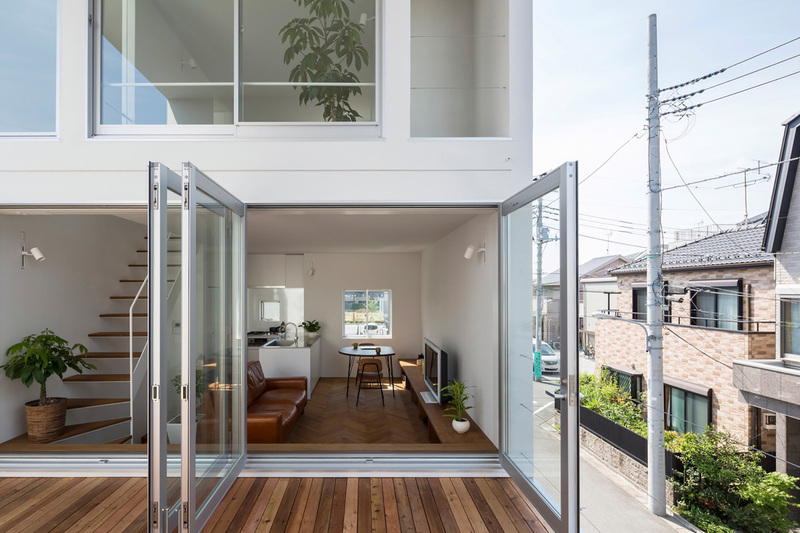 Through the process of designing this house, we tried to prove that having rich private external space was important for making crucial difference in the quality of life inside the house, as well as obtaining various possibilities of external activity. 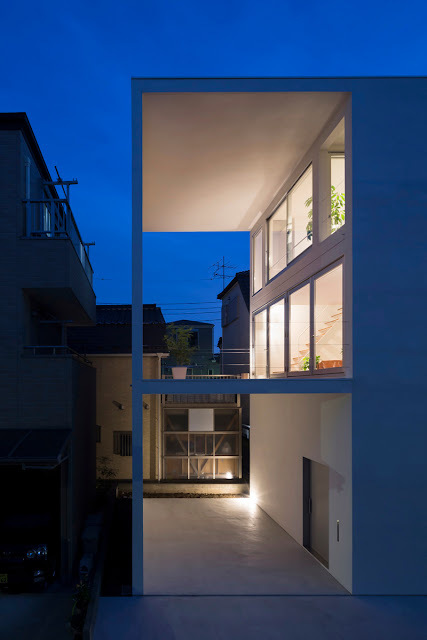 The first thing we decided was having an open-air space next to the main part of the residence, and connecting them with big opening of windows. 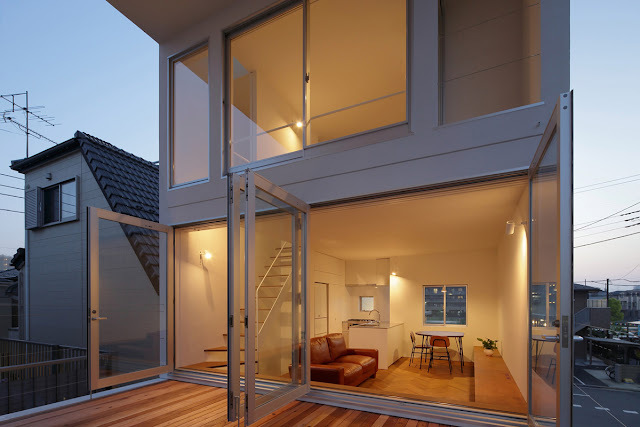 Big Windows, which are necessary for making internal spaces spacious, well-lighted and airy, are one of the most costly parts of buildings, so we concentrated them to selected places, effective for improving the quality of internal spaces. 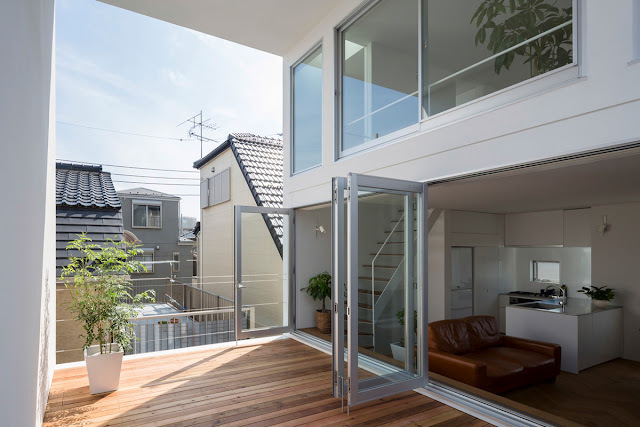 Considering that the client couple’s original request was having a big terrace for doing yoga freely under the sun, connecting the terrace to the living room and the bedroom with big windows was the best way to offer fresh air and daylight to the internal spaces, like having respiratory organ to let the house breathe. The second floor level of the eastern half of the site was chosen as private open-air space, because that place was facing to the rooftop of the single story garage of a neighbouring house on the south. 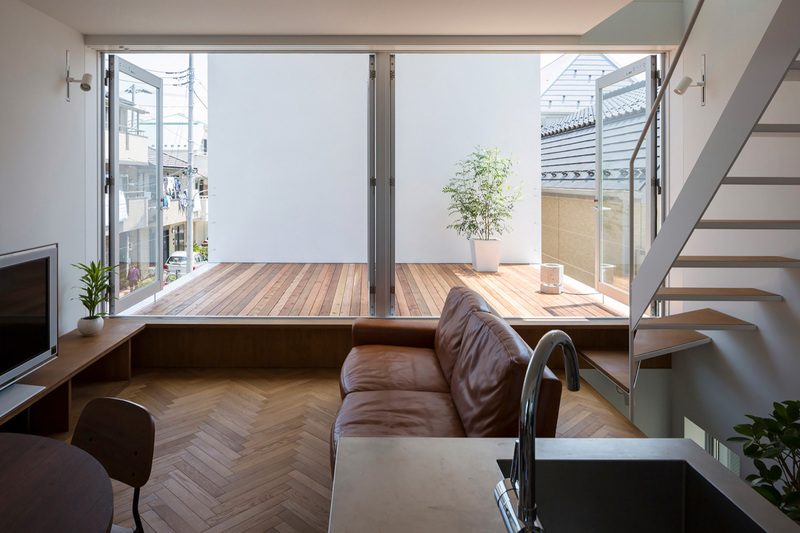 Thanks to the lower height of the garage, this place is exposed to the sunlight in the high density residential area, which is a relatively rare situation in Tokyo. 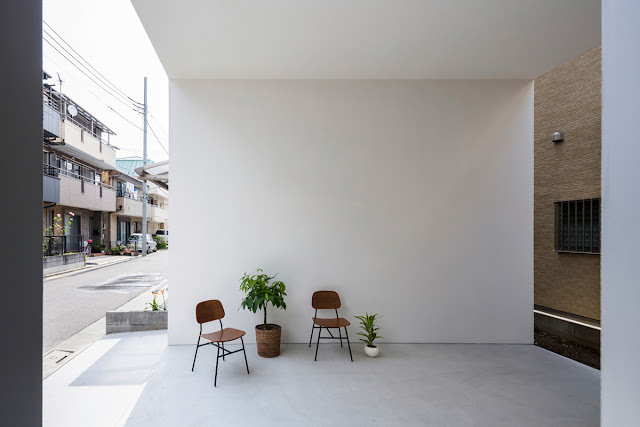 By making a big rectangular tube here penetrating north-south, a bright and airy open space can be obtained. 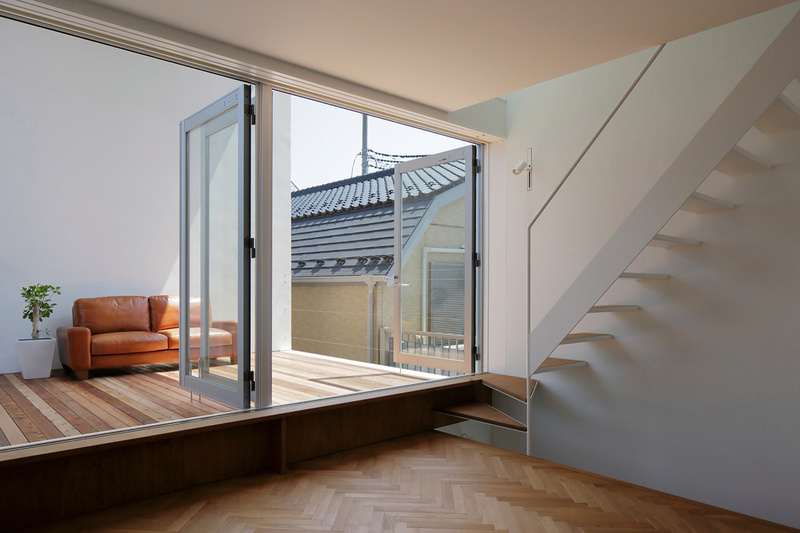 At the same time, the privacy of this external space is protected against very close windows of neighbouring houses on the east, by the wall of the tube closed to that direction. 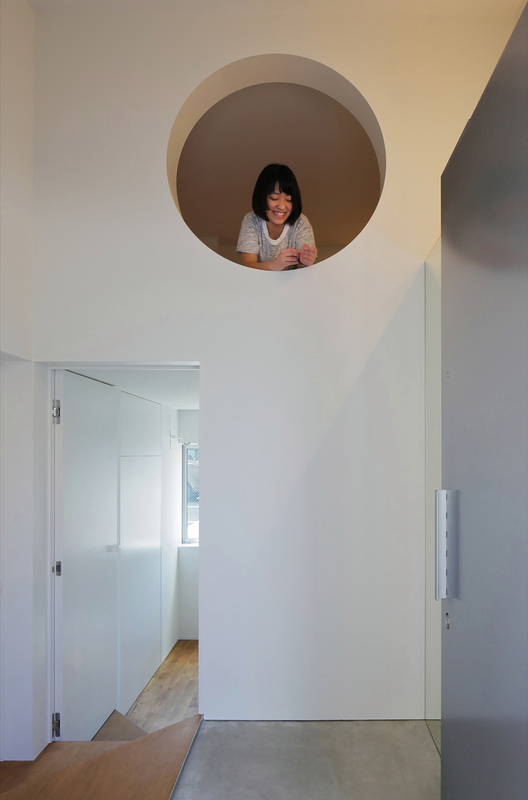 The tube was tried to be made as large as possible, because larger external space can catch more sunshine and larger blue sky. 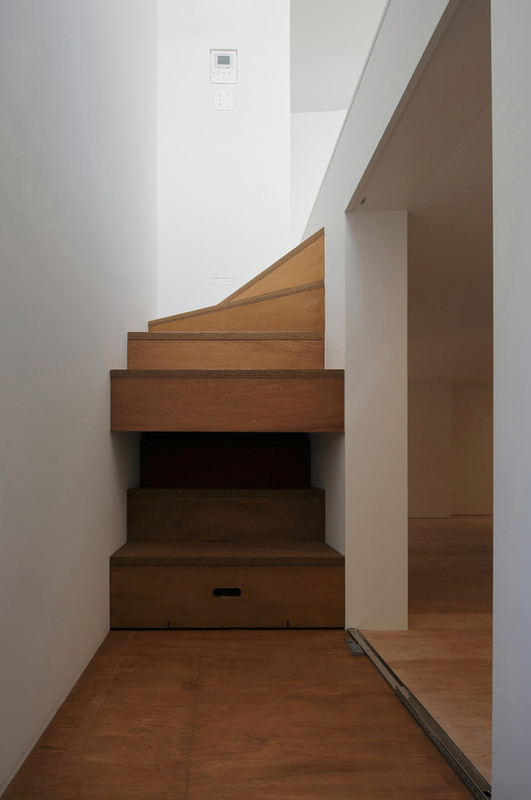 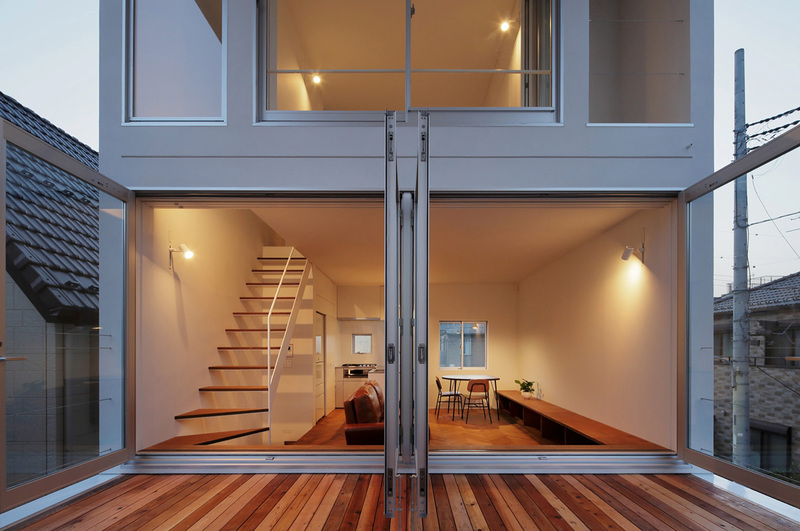 However, having large external space in the limited site area means reduction of the internal space of the house. To make up for the loss of the floor area, an attic for storage was inserted between the first floor and the second, whose ceiling height is less than 1400 mm. 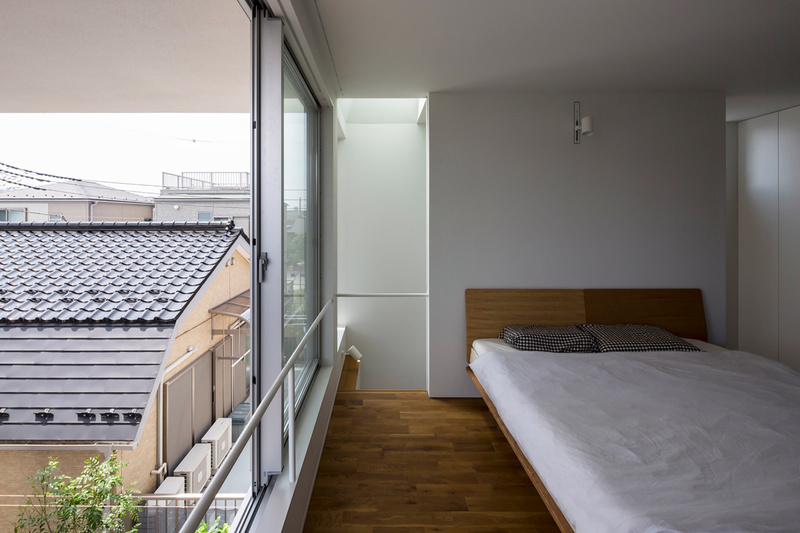 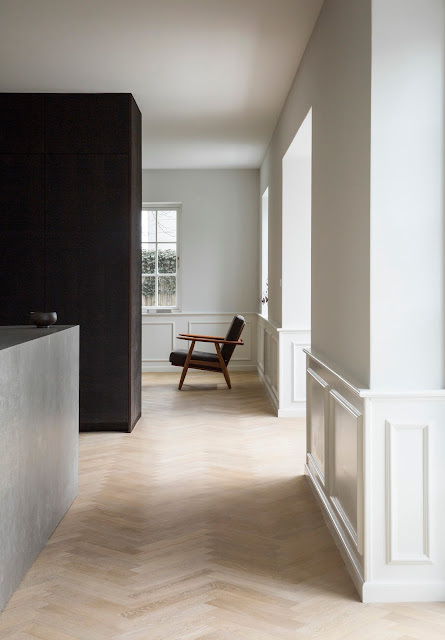 By this arrangement, this house obtained a sufficient amount of the practicable space while the daylighting of the living room and terrace was improved, because the levels of those spaces were pushed up higher.